The family lifestyle market is continuing to drive sales in the Scottish Highlands and being offered the chance to combine family living and owning your very own small business is what many people dream of. The award-winning Isle of Ewe Smokehouse and Fine Food Emporium has been put up for sale through Galbraith Inverness. 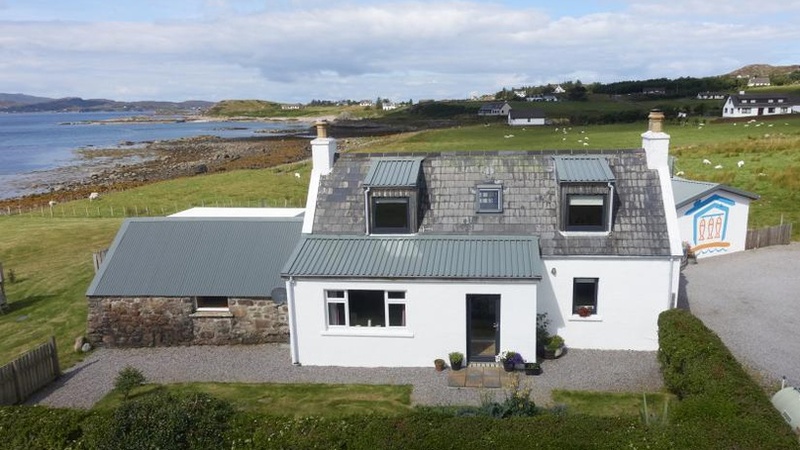 Located in a beautiful loch-side setting on the North Coast 500 route, between the villages of Aultbea and Mellon Charles on the west coast of Scotland, the sale comprises a recently renovated three-bedroom cottage, purpose-built smokehouse with retail shop, preparation rooms, office and renovated stone bothy. Husband and wife team, Alistair and Paula Gordon set up the Isle of Ewe Smokehouse business in 2007 with the aim of producing a high-quality artisan product using Scottish salmon from a sustainable source, for which the west coast of Scotland is so famous. Buying this property, almost ten years ago now, was all about a lifestyle choice for us, being able to develop a business and strong brand, have a family and enjoy living in one of the most amazing places on the planet. We previously lived in Antibes and Greece and worked in the sailing industry, latterly on superyachts. So this property presented a fantastic opportunity for us to combine our passion for the great outdoors with a viable business start-up that we could develop and build on site. We sell all things foodie, smokey and fishy. All our fish are traditionally smoked in stone kilns, using aromatic whisky barrel staves and local larch to give our own unique flavour. We are very proud of what we and our brand have achieved over the last ten years and hope that the next owners are as passionate and enthusiastic about the business, as well as the unique lifestyle that this property offers. The purpose-built smokehouse is designed for easy conversion to alternative business use or as holiday letting accommodation, subject to the necessary consents. The building comprises the shop with display units, the slicing room, a walk-in fridge freezer, wet areas, a hot smoking room and two cold smokers. Smoked Salmon HQ is a contemporary bespoke office come studio Portakabin, which provides office space and stunning views out over the loch. The stone bothy adjacent to the house is fully lined and offers generous storage, laundry and toilet facilities. This too has the potential for conversion, subject to the necessary consents. The cottage, which currently provides the owners' accommodation, has been recently modernised to create a charming and comfortable family home with two reception rooms and three family bedrooms. Improvements include a renovated kitchen extension, new flooring, wall and roof insulation, new double glazing, a new boiler and renovation of the bothy. The Smokehouse offers an excellent opportunity for those looking to acquire an established and profitable business that brings with it a change of lifestyle in a beautiful and unique coastal setting. In addition, the demand for ethical food production, the growing economy of the west coast and the positive impact of the North Coast 500 offer further opportunities both in business and tourism and we expect a lot of interest in this sale. Offers Over 330,000 are being invited for the Isle of Ewe Smokehouse. For more information on the Isle of Ewe Smokehouse Ltd visit www.smokedbyewe.com.